A Howey-in-the-Hills man died Sunday after losing control of a motorcycle he was driving on a curved road in Volusia County, according to the Florida Highway Patrol. The 50-year-old Howey-in-the-Hills resident was pronounced dead after a crash that involved three motorcyclists around 10:40 a.m. Sunday. FHP believes the man was joined by two other bikers all driving Harley-Davidson motorcycles and traveling eastbound on Maytown Road near Maytown Spur Road in Volusia County. As the three motorcyclists entered a curve, the deceased lost control of his bike and collided with the other men, according to the FHP. All three men were ejected from their motorcycles. Two of the men were not wearing helmets. The two surviving crash victims were taken to Halifax Medical Center. One was listed as having serious injuries and the other had minor injuries. A spokeswoman for FHP said in a statement that the fatal crash remains under investigation, and that the crash was not alcohol-related. While many bikers like to take solo excursions, an organized motorcycle ride with a group of friends can be an exciting change of pace. However, as with anything that involves more people, there are increased safety risks in group riding. Safety experts recommend a staggered riding formation where riders are spaced at least two bike lengths apart. This is the best riding format because it creates a gap between the motorcycles so riders have the time and space needed to maneuver around hazards or react to an emergency situation. When visibility is poor or there are road hazards, riding single file is best. It is recommended to avoid riding side-by-side, and of course, always follow traffic laws. Motorcycle accidents can be avoided, but sometimes riding safely isn’t always enough. 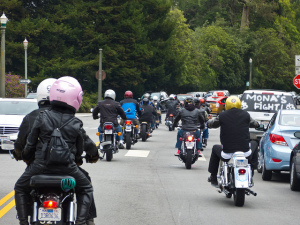 Many motorcycle accidents are caused by drivers who are not paying attention to bikers or watching out for motorcycles. If you were injured in a motorcycle wreck, a Florida Motorcycle Accident Injury Lawyer at Whittel & Melton can help. We can review the details of your accident and advise you about your legal options. Call us today toll-free at 866-608-5529 or contact us online.